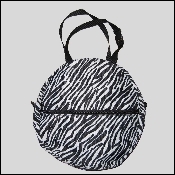 All Products >> Nylon Rope Bag Zebra - Youth 12"
Nylon Rope Bag Zebra - Youth 12"
Well built and economical nylon shell rope bag. Outside zippered pocket, web handles and release snap. Unlined, 12" diameter, zebra print. FYI: This item has been discontinued by the manufacturer and we only have a few left! !